Patina is the rich, layered, worn layer that develops naturally, over a long period of time, on the surface of materials like stone, metal, wood, and leather. This patina is the unique result of an aging process that involves a combination of time, weather, and handling. If an object was knocked over and dinged in 1891, the owner likely wasn’t too happy about it at the time. But add a hundred years or so, and that ding gets filled with lichen and moss, adding character and charm that can’t be duplicated. As the owner of Inner Gardens, I am both an antiques dealer and a landscape designer. My love of patina dates back 30 years, to when I first started collecting vessels, one by one. I was attracted to the depth of character, the history, and the earthiness of older objects. They had interesting surfaces with details that can only come with age. New objects – and older objects that have been carefully preserved – have a sterility about them that I find unappealing. Older pieces have heart and soul, which means that incorporating older, patinated pieces adds heart and soul to our homes and gardens. An old object with a patina adds instant character and warmth to your garden and home. 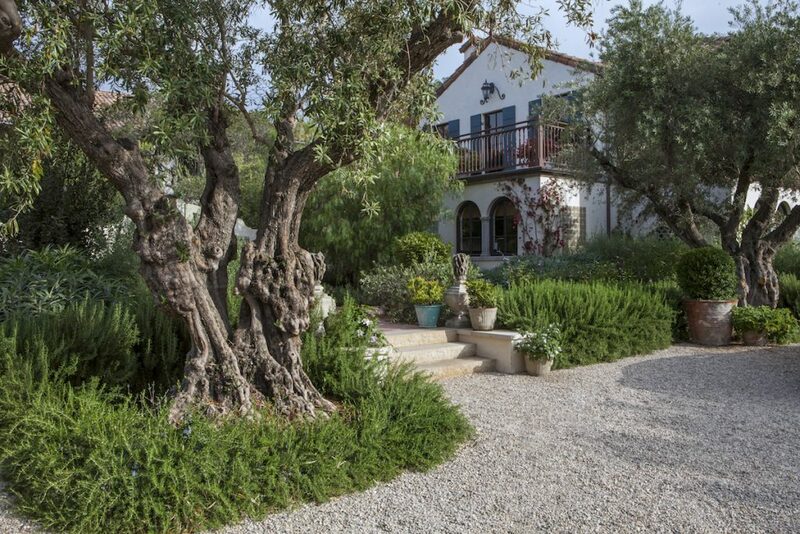 When I design gardens–and you can do the same with your own–I seek to age each space. Adding four of my favorite antique objects is an easy way to accomplish this. Not everyone has a gate, but I love the way a garden gate brings an outdoor space together. While gates can be made from any number of materials, if you want one with a particularly nice patina, it will likely be made of old, rusty iron. I love iron garden gates that have a dark patina, or a rustic wooden gate with peeling paint for an authentic shabby chic look. A weathered garden gate with overgrowth is a beautiful way to accentuate the entrance or distinct rooms of the garden. A beautiful vintage fountain or pedestal bird bath can easily become the focal point of a garden. A copper fountain with a green patina or a stone birdbath covered in lichen are both striking choices that set the tone for your outdoor living space. Don’t be deterred by rust! Like wrinkles on a face that has aged gracefully, rust and other “damage” are beautiful marks left by time. As a collector and a landscape designer, vessels are near and dear to my heart. Whether you want to make a dramatic statement or add a quiet accent to a garden, simply adding a planter will accomplish that (and more). The beautiful thing about pots and planters is that they come in so many different materials, shapes, and sizes. The options, even if you are only considering old ones, are nearly endless. 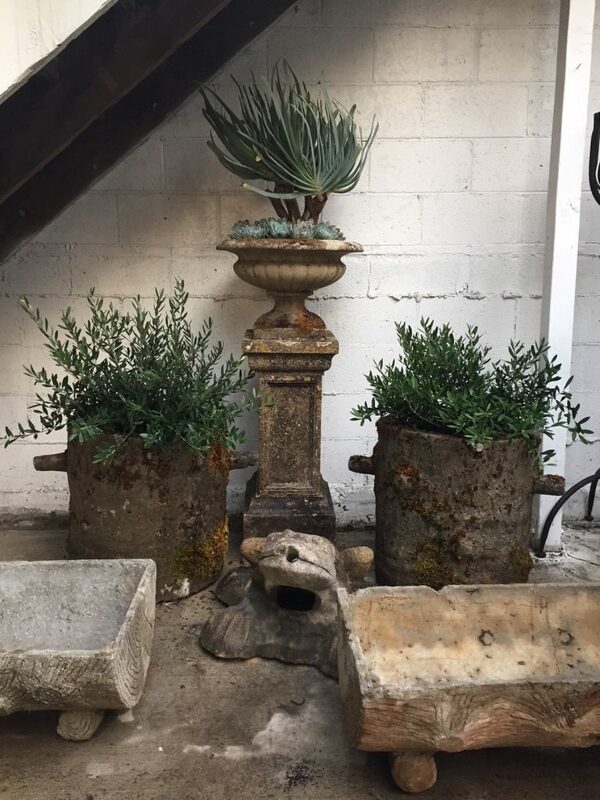 Metal pots and planters are strong and sturdy and naturally form a patina when left outdoors for long periods of time. The natural corrosion can leave gorgeous patterns that no paint can imitate. Marble or stone planters, when exposed to the elements, soften around the edges over time and create an elegant accent in the garden. Ceramic pots and planters can last for centuries, whether they are made of stoneware or porcelain, terracotta or other earthenware. Depending on what type of clay they are made from (and what kind of glaze, if any, was applied), they develop patina in different, interesting ways. While wood may not be the most durable material available, a distressed wooden planter with peeling paint may be just what your garden is missing. And the beautiful thing about pots is that they can be moved around, so they can also be brought into the home. No two pots, even if they were made in the same way at the same time and from the same material, age the same way. Finding the right one for you and your garden may take time, but I guarantee you’ll enjoy it and learn so much in the process. Not only does a console table with patina add character to the house, but it is also practical. It can store mail, keys, and other trinkets in your entryway, and it sets the tone of welcome — for both you and your guests. It provides you with a flat surface to support objets d’art and tabletop planters. A console table may be made of wood, metal, stone, or a combination of those materials. If it is an aged piece with patina and unique characteristics, it will make a one-of-a-kind statement about you and your home. The United States is a young country and everything here is new, as opposed to Europe with its thousands of years of history. There is a depth of culture everywhere in Europe that is mostly lacking here, simply because we are so young. I love feeling connected to the past. Through my work, I use patina to infuse history and depth into contemporary environments. While patina is mainly used as a physical descriptor, I think of it as a feeling. Being in an indoor or outdoor space with old objects creates a feeling of comfort and warmth that is difficult to otherwise create. Patina evokes the soul of the piece. It shows its history, its passage through time, its struggles. Patina is honest — dings, cracks, peeling layers, and all. I love it when I can look at a piece and know where and when it came from, tracing its journey from the moment it was created until the present time, nestled in my garden.